Walmart, the world’s largest retailer, on Tuesday said it was “disappointed with the recent change in law and lack of consultation” with regard to the new e-commerce regulations in India. But, it was confident of the long-term prospects of its India unit, Flipkart. The Bentonville-headquartered company, which announced its 2018-19 (Walmart follows the February-January financial year) results on Tuesday, got a major leg up from Flipkart in its gross sales, despite divestment of its Brazilian unit. However, its operating income and profitability took a hit due to continued investment in its Indian subsidiary. “In terms of the regulatory environment in India, we are disappointed with the recent change in law but the team is working to ensure we are in compliance with the new rules. We hope for a collaborative regulatory process in the future. This will result in a level playing field,” said Doug McMillon, president and chief executive officer, Walmart, during an analyst call. The change in e-commerce policy came into effect from February 1. It bars e-commerce companies from selling products through firms in which they have a stake. Companies operating in this space also cannot earn more than 25 per cent of total revenue from a single platform. 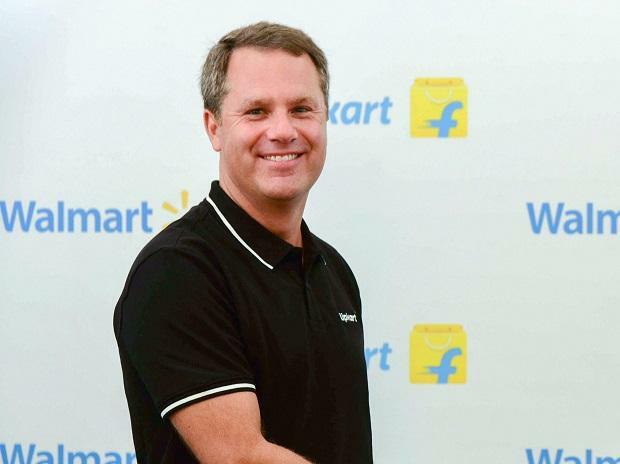 McMillon, however, said the new regulations have not shaken Walmart’s “confidence and excitement” about Flipkart’s long-term prospects as the business has behaved in line with their expectations. The company, he said, remained optimistic about India’s e-commerce opportunity, given the size of the market, the low penetration in the retail channel, and the pace at which it was growing. “We hope to work with the government for pro-growth policies that can allow this nascent industry and the domestic manufacturers, farmers, and suppliers to benefit from it,” said McMillon. Walmart said Flipkart was already an ecosystem comprising digital payment company PhonePe, last-mile delivery systems, and fashion arms such as Myntra and Jabong. In the just-ended financial year, Flipkart left its imprint on all the financial numbers of the US-based company and even impacted its guidance for the next financial year. Despite supplementing its overall sales growth, the domestic e-commerce firm continued to drag its gross profit rate, apart from its operating income. In the fourth quarter ended January, Walmart International — under which Flipkart’s sales numbers are reported — posted net sales of $32.32 billion, a 2.3 per cent decline over the same period of the previous year. However, the sales number was negatively affected by $1.7 billion owing to cross-currency movements. “The deconsolidation of Brazil was a sales headwind in the quarter offset by the inclusion of Flipkart sales for a full quarter,” the company said in its presentation to investors. Similarly, the operating income of Walmart International declined 9.9 per cent to $1.17 billion during the quarter. The gross profit rate also dipped 116 basis points in this period, which was largely due to Flipkart. For the whole financial year, the acquisition of the Indian ecommerce firm at $16 billion also pushed up Walmart’s debt-to-total capitalisation ratio. Continued investment in Flipkart also weighed on the earnings outlook of the US firm for 2019-20. While the company said its sales numbers will be supplemented by Flipkart’s growth, its operating income will be hit owing to its investment in the Indian subsidiary. “Primarily in Q1, it is going to be related to Flipkart. The major part (of impact on operating income) will be from Flipkart in Q1 and Q2 (of FY20). That didn’t come in our results (in the first two quarters of FY19). But, Flipkart is the biggest part of that next year,” McMillon added. For 2019-20, Walmart expects its consolidated net sales to grow by 3 per cent with positive contribution from Flipkart. Similarly, sales from its international wing is likely to grow about 5 per cent in constant currency terms. However, operating income of Walmart is likely to decline by a low single-digit percentage owing to continued investment in the Indian unit.